Now that the pool is open for the season, we’re all finally excited about summer. With another record-breaking season forecast, remember firstly to protect your family (including your pets) from heat stroke. One of our long-time sponsors, Healing Paws, would have some excellent advice on how to keep your pets cool! We have no shortage of places within walking distance to cool down. On a scorching hot day, seeking relief under the forest canopy with a walk along Shoreline Trail is easy, free, and rejuvenating. Heading along the north side of the inlet, you will soon come to Old Orchard Park and its small beach which usually has an abundance of spots to lay your beach towel down, open a book and enjoy the sounds of the water. If you choose to wander towards Rocky Point Park, after a quick run through the spray park you could head to Rocky Point Ice Cream, get out onto the water with Rocky Point Kayak, and afterwards, wander along Brewery Row. Of course, there’s our own pool as well! Despite a slightly late start to the season, our Canoe Club and pool remains highly popular (be sure to access the pool via the change rooms and take note of the pool rules – remember that there isn’t a lifeguard on duty so swim safe and respect your neighbours). Finally, Caffe Divano make a selection of fresh smoothies with real ingredients. Our local café is and has been integral to our community since the very beginning. It’s a community gathering space, a valued neighbour, and of course, another great place to relax and cool down in the summer. Again, stay cool in the heat. 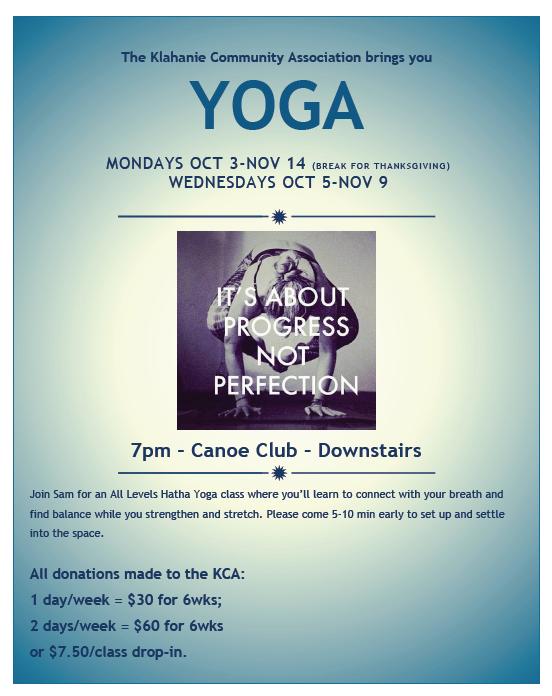 Klahanie Health & Wellness – New Fall Classes!